The Leahs are part of my Dads family. I remember this when it was Rutter’s farm, as I used to spend all my spare time up there when I was at school up until I left Killamarsh in 1967 to join NAAFI – attached to the Royal Navy. I had left the village by the time the photo was taken, but I remember the farm layout very well. The field on the far right was The Croft , where we used to put newly calved cows and their calves for the first few days after calving. There were several chicken huts in that field. Also Rutter’s always had the odd pony or 2 which were kept in there. The lane was Quarry Lane, and went over the canal bridge and up to Rutter’s fields at the other side. The canal was still there, but empty, (it’s been filled in on the photo). Quarry Lane obviously got it’s name from the fact that one of the “up over” fields contained a small quarry, which is where the stone for the original buildings came from. 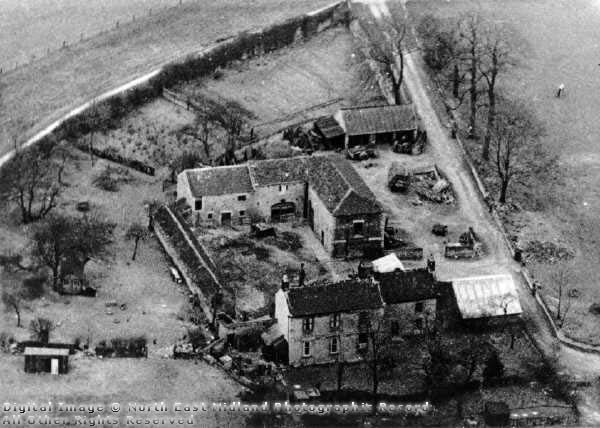 The white roofed building far right was the tractor garage, and joined on was the farmhouse, which was in turn joined onto the bigger house on the left. When I started going to the farm aged about 12, George Leah and George Hardy ( he used to be the postman) still lived in part of the big house. In front of the house was the farm yard, surrounded by buildings. The long row on the left were loose boxes for isolating cattle and storing root crops through the winter. The big L shaped building at the top of the yard was the “12 Byre” then the ” 6 Byre” then the building end on to the farmhouse was the Granary and Hay Barn. On the right of the barns was the Stackyard which as it’s name suggests, is where we built the Corn stacks and where the threshing machine used to stand at threshing time. After we started using combine harvesters and balers, this area became an implement storage area. The open fronted building at the back of the stackyard were originally horse stables (the feeding troughs were still in situ) but they were used for implement sheds. On the far left was the orchard, which again had several chicken sheds in it. The field in the very bottom left was where Doctor Charles Lipp kept his hunters. There is a shed shown up against the hedge and to the right – in the hedge, was a mulberry bush, which I was assured was over 700 years old, and it still bore fruit. I ate many a pound of mulberries during my time at the farm. Finally running under the orchard was a spring which came out of the ground into a stone trough, where we used to let the cattle drink. As I remember, the spring water was crystal clear, it never dried up completely even in the driest weather and I also remember that several older people in the village used to bring bottles to fill from the spring, claiming it had health giving properties. Whether it did or not I don’t know, but must have drunk gallons of it over the years!